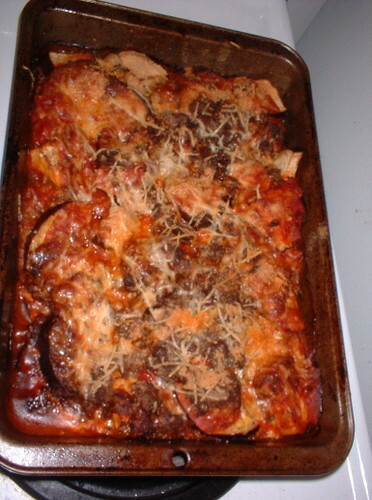 A low-carb "lasagna" made with eggplant, ground beef, cheese, and tomato sauce. The people at church usually hate the healthy food I cook, but this dish was demolished. Definitely a winner. This lasagna is so tasty that I promise you will not miss the meal or the noodles! Look A New Vegetable Lasagna Recipe! Are you sick and tired of trying to find healthy dinner recipes that your family will eat? Do your kids refer to the healthy food you cook them as ”seaweed?” Well, you should know that there are tons of great recipes that are healthy and delicious. Here”s one that the whole family will love. You want to try and use organic foods as much as possible in your healthy dinner recipes. Organic foods are free of pesticides, hormones and harmful toxins. Here”s how you make this delicious lasagna. Preheat your oven to 375 degrees. In a large saucepan, drizzle your olive oil, and allow it to heat up. Then place your garlic in to saute a bit. After it”s sizzling pretty well, you want to add your eggplant, zucchini, and mushrooms. Bring a pot of water to a boil, and place your lasagna noodles in it. Allow it to boil until your noodles are almost done. This will take around 30 minutes. Continue to saute your vegetables until they are almost completely done. Then, you will layer your lasagna noodles, veggie mixture, pasta sauce, and cheeses in a large baking dish. When you have used all of the ingredients, finish off with the last layer of cheese and sprinkle on the oregano. Instead of using salt for your healthy dinner recipes, find a great seasoning that will add flavor without the consequences. Enjoy!